Comments: Book shows more wear and tear than a good book. Contains highlighting and/or writing/underlining. There is a crease on the front cover of the book. Cover art may differ from stock photo. Conceptual Physical Science: Explorations presents a clear and engaging introduction to physics, chemistry, astonomy, and earth sciences. The authors use analogies and everyday examples to clarify key concepts and help readers better understand the world around them. The book's consistent, high-quality coverage combines active learning with critical thinking exercises, hands-on experiments, review questions, and quantitative problems. Hands-On Explorations, found throughout the book, promote active learning by allowing readers to apply concepts they have learned. These easy-to-perform experiments, which use common household products, can be conducted at home. 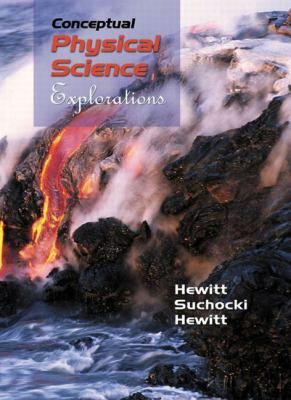 For college instructors and students, or anyone interested in chemistry, earth science, astronomy, and physics.Hewitt, Paul G. is the author of 'Conceptual Physical Science-- Explorations ', published 2002 under ISBN 9780321051660 and ISBN 0321051661. Loading marketplace prices 7 copies from $2.58 How does the rental process work?